Are lots of ugly shoots appearing at the base of your favorite tree? Trim those suckers down! Book us today for fun educational seminars! We offer a range of subjects from edible gardening to maintenance know-how to gardening for pollinators & non-stop garden interest. Get in touch today to find out more & book us for your forthcoming event! Jessi Bloom of Northwest Bloom never ceases to amaze and inspire me. Where many garden professionals talk a lot about the environment and sustainability, Jessi walks that path everyday. 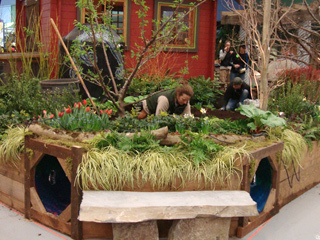 Her fantastic display garden at the 2010 Northwest Flower and Garden Show illustrates her commitment beautifully. And, clearly I’m not the only one who thinks so. During the gala dinner, Roger Swain, one the judges and PBS The Victory Garden Star, approached Jessi and me to congratulate her on her garden. Who knew how much of a flirt he could be? After Jessi somewhat meekly asked, “Did you like my garden?” Roger ribbed back with a genuine smile on his face, “Well, did you see all the medals? Do you think that’s enough? I think you got them all. Of course, I like it.” We continued to chat, and before he headed off to meet others, Roger patted Jessi and me both on the back while reaching into his bag to extract a gift of a kumquat for each of us, “Being horticultural ladies, I know you’ll know what this is. These are the last kumquats you’ll see for a while. I brought them from Florida where the crop has now frozen. And the California crop is quarantined. Enjoy!” I suppose in many ways — at least for me — these small bites of citrus were a unique award equal in many ways to the ribbons and statues now adorning Jessi and Noah’s garden. Roger is, afterall, the Julia Child of gardening television to an old hat like me. Noah, Jessi’s son and co-designer, was so proud of his achievement that the ribbon for Gala Choice eventually became part of his outfit. And, his pride was hard earned. Not only did he conceptualize many of the elements in the garden, but at eight years old he worked for hours on 3D renderings of his concepts and helped construct elements like “the hatch” and a bridge that became key recycled elements in the garden. Sadly, Noah was too young to be allowed on the construction floor. I’m certain had he been there, he would have been the one called “Boss”. Someday he likely will be if his enthusiasm says anything about his future in the garden. Last night, at the Arboretum Fundraiser Gala during which donors are allowed an early peek at the gardens and bid on silent auction items like my garden coaching session donation, Jessi and I enjoyed some time relaxing while sipping some of the local, award-winning wine donated by Domanico Cellars for her display. (We had to crack open a bottle to celebrate after all, right?) As Jessi sighed in happy, glowing relief, she commented, “Creating one of these gardens is like giving birth.” Together we laughed as I quipped back: “I guess that makes me your Doula.” Fortunately, she hadn’t actually just had a child, so we toasted the garden, continued drinking wine, and reveled in the moment. No, I wasn’t a co-creator. That was Noah’s job. Mine was to be there for a friend, offer encouragement, design feedback, support, comedy-relief, distraction, food runs, and hard work while she brought her fantastic baby to life. It was an honor, and I’m just as proud as I as can be! Kudos Jessi and Noah — you deserve it all! Want to see Jessi’s garden and other show gardens come to life? 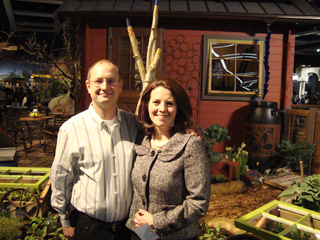 Check back soon for a link to a forthcoming edition of GardenWorld Report where I’m providing a guest report with a behind the scenes look at building show gardens at the 2010 Northwest Flower and Garden Show. Or get down to the Northwest Flower and Garden show this week. The event runs from today, February 3-7, 2010. I’ll be at the show speaking this weekend, too! I loved this garden and just knew it was one for Jessi to be proud of. Congrats to all of you for sharing a joyful garden! Loved reading this and seeing the interaction of mother, son, husband, friends, and community that reflect how gardens grow us together. I’m thinking this needs to be a road trip for me next year! I can’t wait to see it! Heading down there tomorrow. Already heard that this one was the one to see. Hooray! It’s what I hoped to see more of last year, when the theme was supposed to be “Sustainability.” Kudos to you and your friends! What a proud moment. What a wonderful tribute to your friends and the birth of their creation. All of the work, dedication and creativity of Jessi and Noah really paid off! As Karen said so well, this is a moment for everyone involved (including Seattle Tilth) to be proud of for all of their contributions! Congratulations to both Jessi, her family and YOU!